It’s not that services or even money isn’t available to address homeless problems in Bunnell and Flagler County. But the money and services are fractured between agencies and by the many definitions of what a homeless person is. About a third of the homeless are on the streets or living in tents in out-of-the-way places by choice. Another third are homeless because of drugs or alcohol problems. And another third are homeless because of life-changing shocks: sudden unemployment, bankruptcy, illness. What money is available from government and non-profit agencies is parceled out among those needs, and regulated by them: money earmarked for families with children can’t be spent on the adult homeless man indulging a drug addiction. Money earmarked for addicts can’t be spent on subsidizing shelters like Bunnell’s Sheltering Tree at First United Methodist Church. And there is no single, central clearinghouse for homeless money or programs, no central place that administers all sources of funding and parcels out all possible sources of help, reducing duplication or making it easier for the homeless themselves to know where to turn. Those are some of the issues an audience of about 50 people learned, or heard again, during a two-hour forum on Flagler County’s homeless problem. 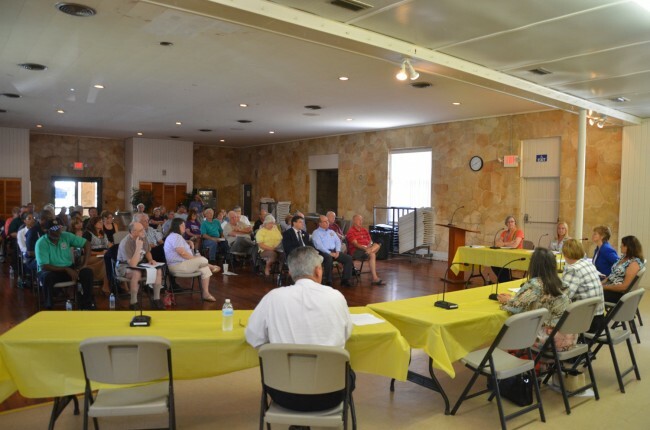 The forum, held Friday afternoon at the old Bunnell City Hall, was organized by Bunnell City Manager Armando Martinez and Mayor Catherine Robinson as the latest response to the latest complaints focusing, as they have in the past, on homeless people gathering at First United Methodist Church. The complaints have always been vague and anecdotal, as sensational as they have been unsubstantiated: that the homeless who get taken care of by the church are a source of trouble in Bunnell, that they loiter, litter, light fires, scare residents at all hours of the night and have caused crime to increase. The latter charge has yet to be substantiated by the Bunnell Police Department itself (the department never made the charge: it’s been made, without documentation, by residents), whose chief, Jeff Hoffman, has told the city commission that the city will not arrest its way out of the homeless problem. The one institution that has done the most by far to help the homeless—and in Bunnell, the only institution that has done anything at all to do so—is the church, with the Sheltering Tree organization that it shelters. For that, the church has been the lightning rod of criticism, but also, in a more positive sense, the trigger of an ongoing discussion about homelessness that would not have taken place without the church’s perseverance: it has refused to back down. Homelessness has been just as resolute. The meeting generated a lot of varied ideas with a panel that included representatives from the Volusia-Flagler Coalition for the Homeless, Flagler County Workforce Development, the Sheltering Tree, the United Way of Volusia and Flagler County, which channels a lot of money into homeless programs, and a member of the Jacksonville Homeless Coalition. Beth Gardner, the pastor at First United Methodist Church, was also at the table. They all spoke of their roles and the services or money they contribute. Absent from the table were two significant players: a representative from Flagler County government (although three county commissioners and County Administrator Craig Coffey were in the audience for much of the forum), and one from Flagler County schools. Both agencies contribute big resources toward homeless mitigation. Those services don’t often get recognized, because they’re part of larger bureaucracies. But they are particularly effective at homeless prevention: the county coordinates a monthly outreach program, Access Flagler, that provides food, clothing, grooming and legal services and other help to the homeless when it’s held at the County Fairgrounds the first Friday of every month. It underwrites an indigent health care program, provides rent and utility assistance to prevent homelessness, and manages grants that offer related services. The county is also the organizer of the annual Feed Flagler initiative at Thanksgiving, which provides free food to some 2,000 people the day before Thanksgiving, and a week’s worth of groceries to hundreds of families. The school district has its own administrative efforts to track and help more than 200 children classified as homeless, even though they may not be in the streets: the moment a family with children is in transitional housing, that family is categorized as homeless. Representatives from either Palm Coast or Flagler Beach were also absent, either at the table or in the audience. But the more the web of homelessness—whether its extent or the variety of services available to address it—was woven before Friday’s audience, the more Bunnell’s particular problem appeared to sharpen as only one particularly visible part of the issue, with little left to address it other than what such organizations as the Sheltering Tree and the church were, in fact, providing. Some people who spoke to the panel suggested that Bunnell or the county could—through a non-profit, through donated land or a house constructed by Habitat for Humanity—create some form of transitional housing system where the homeless who gather at the church could instead be housed, such a plan would entail more money and manpower than is available currently. And the panelists themselves on several occasions commended Bunnell and Flagler for doing what’s already being done to address the matter. In other words, the notion that Flagler is not addressing its problem is more fallacy than truth, though the manner in which one aspect of the problem has been highlighted—the homeless who gather at the Methodist Church—may have disproportionately skewed the issue, distorting its extent and gravity. Charles Gardner, who is married to Beth Gardner, the pastor at First United Methodist Church, addressed the assembly toward the end of the forum to say that the meeting was called after just two people complained about two homeless people. The two homeless individuals in question have left town, Gardner said. Noticeably absent from the forum were Bunnell City Commissioners Tucker, Rogers and Baxley. Why not open up and allow them to stay in that Taj Mahal county building. At least it will be put to some good use.. Maybe the school board will help set this up.. Ya Right!!!! Better yet buy and convert the old hospital into a homeless shelter. Palm Coast is probably looking for a way to write an ordinance that would make homelessness a city code violation. Now that’s too funny……….although it wouldn’t surprise me one bit.